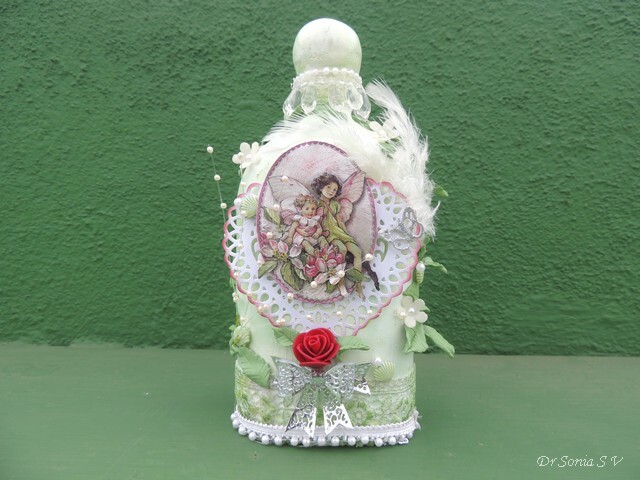 Mounted a 3 D decoupage fairy image with nearly 5 layers atop a lacey heart on one side of the bottle . 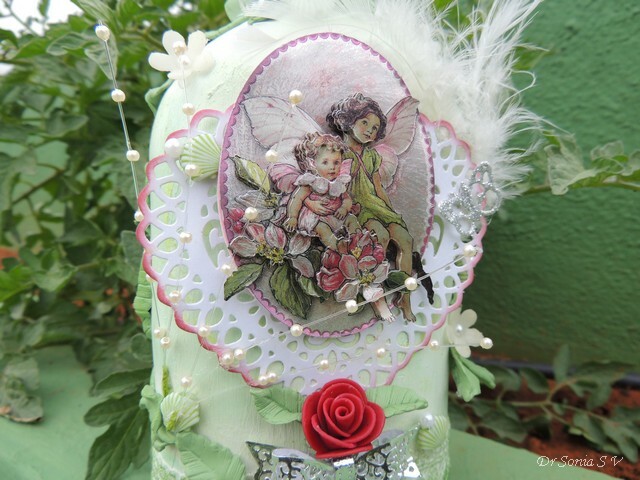 [Here are more examples of similar fairy 3 D decoupage : Spinning card tutorial and Altered Tin can]. 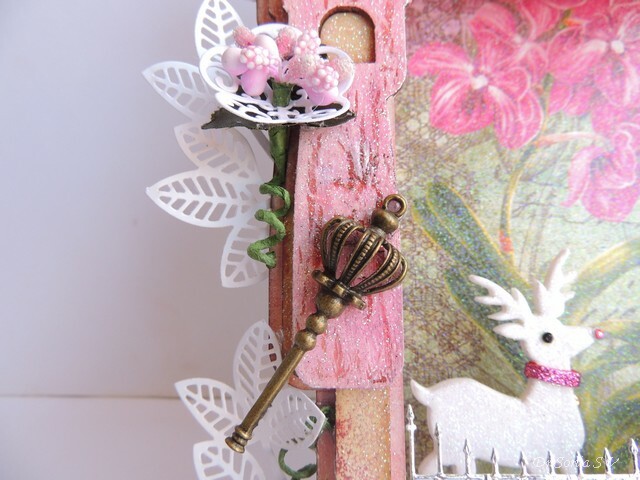 Added a spray of pearls to splay over the little fairies! 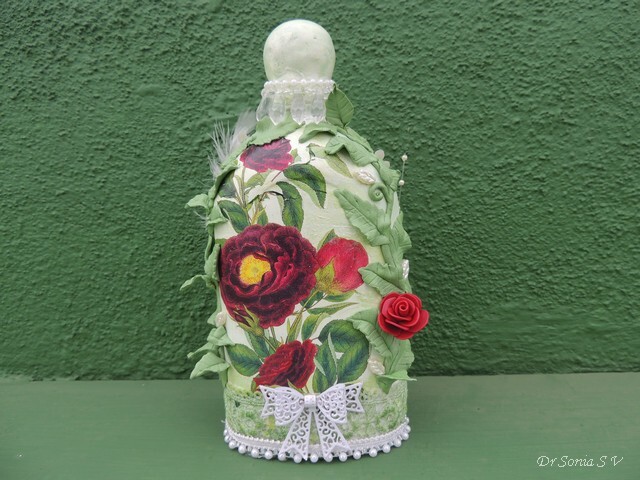 The other side of the bottle has a floral image which at first sight looks like paper/ napkin decoupage...well its neither! 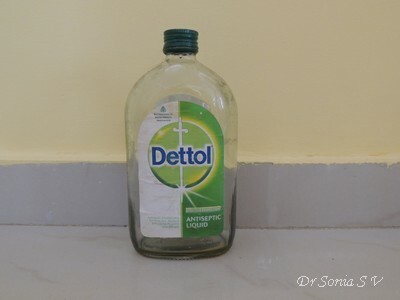 The image is a beautiful tattoo I had picked up from a local super market and experimented on the bottle using water to transfer the image! Haha yes it worked much to my surprise!! 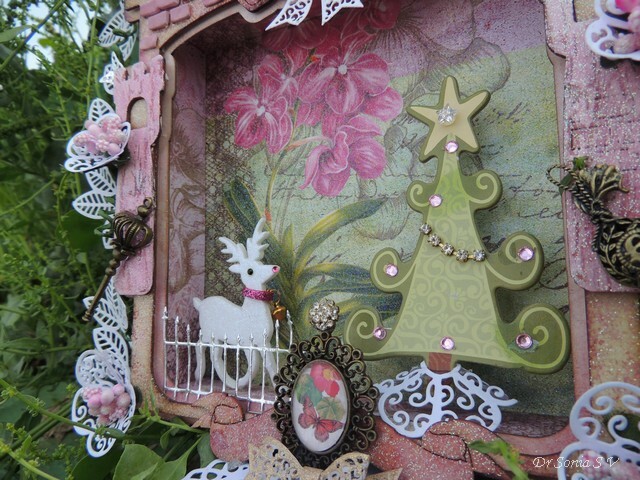 Anyway gave it a top coat of modpodge so that it doesn't flake off! 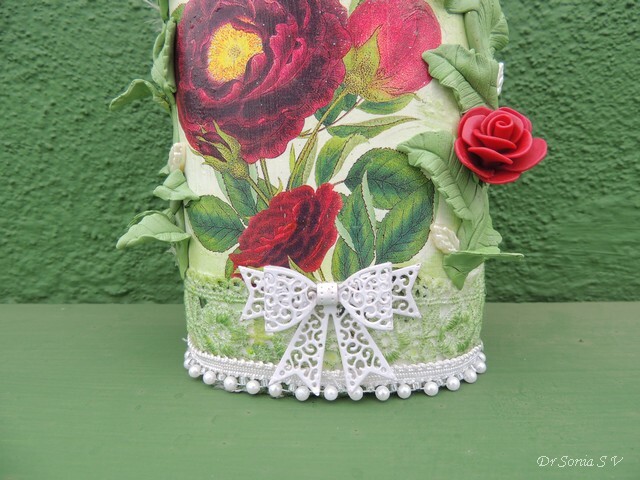 Mixed green oil colour in while kneading the 2 components of the Mseal and hence could achieve a better look than my rose leaves in Mseal Roses Art. 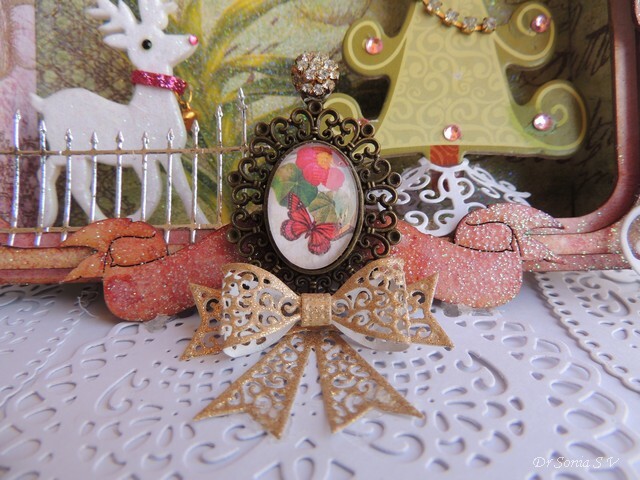 The lacey white bow was made with a Sue Wilson die [ a gift from Shalini of Crafters Corner] and those pearly leaves are a find from a local fancy store! 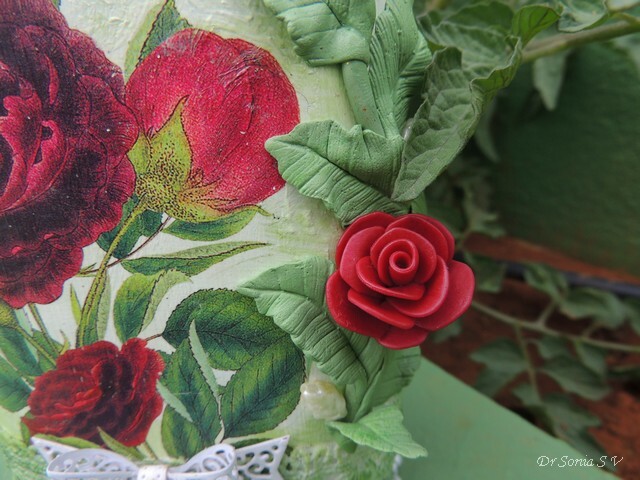 Here are the Mseal clay leaves winding over the edge of my altered bottle! The best thing about Mseal is you dont have to use an additional glue to stick it ! If you work while the Mseal is soft and pliable it will stick easily to glass/ wood/ metal!! 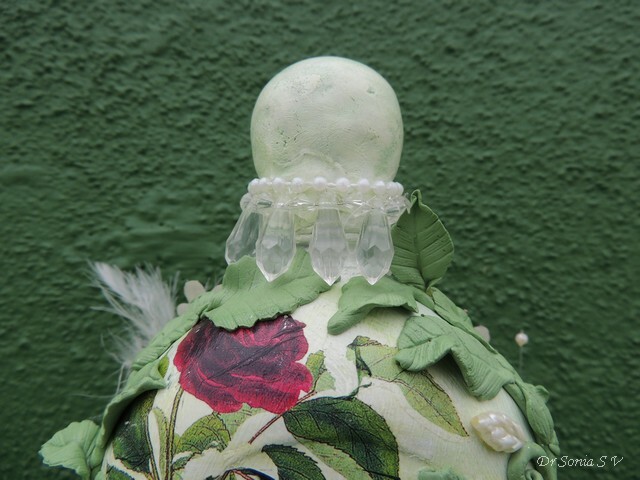 The Dettol bottle had a rather sorry looking cap and I sculpted a more glamorous faux cap using Mseal and gave it a skirt of dangling crystal beads! Not too happy about the faux cap painting though! 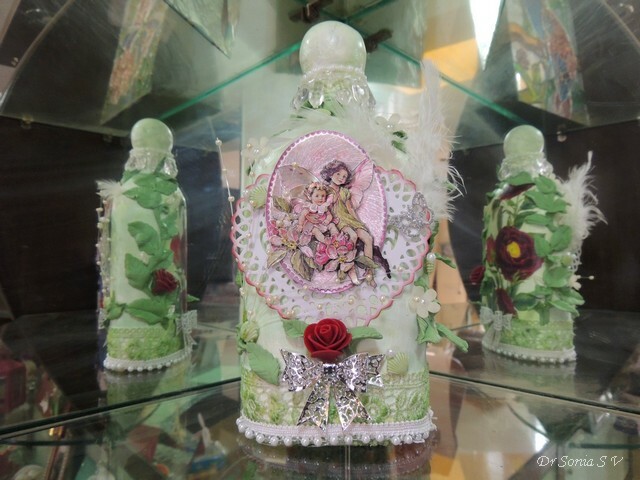 Here is my altered bottle sitting in our showcase and the mirrors reflecting the other side too! 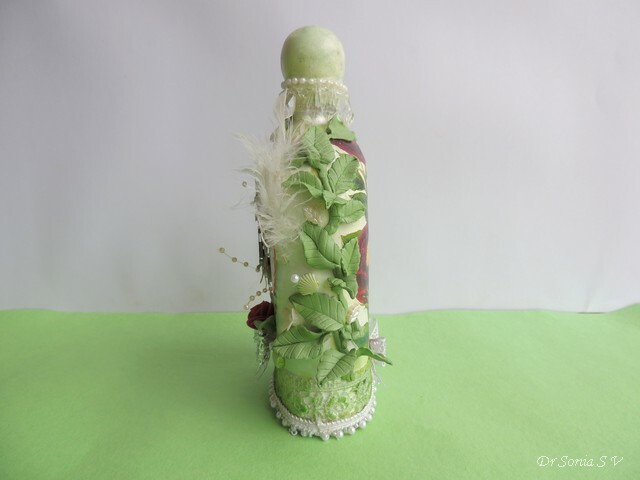 My bottle went to the multi-talented Anuja...hope she likes it ! 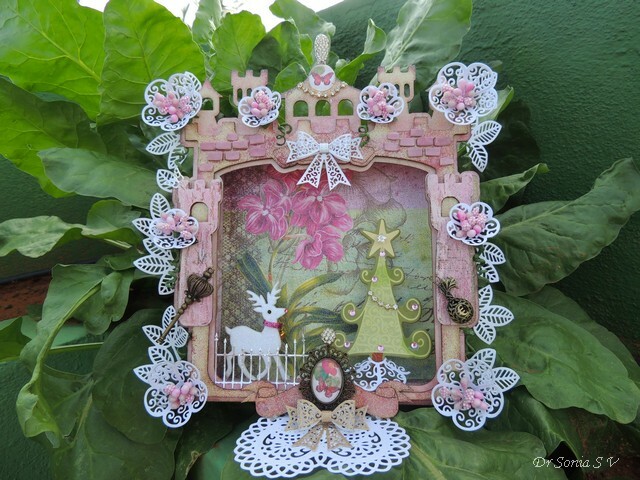 Dear friends sharing a Castle shaped shadow box which I made for my DT project with Crafters Corner using a kit manufactured by LaLaLand Crafts. 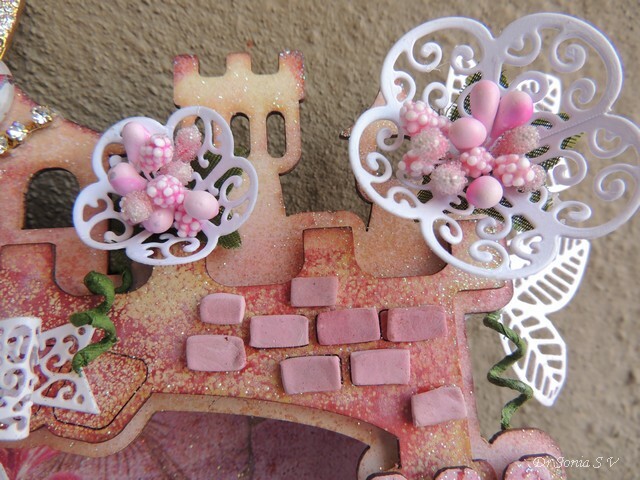 I had a lot of fun altering the MDF/chipboard pieces with distress inks, pearly mists and clear sparkle embossing but my favorite element in the castle is the glass cabochons! 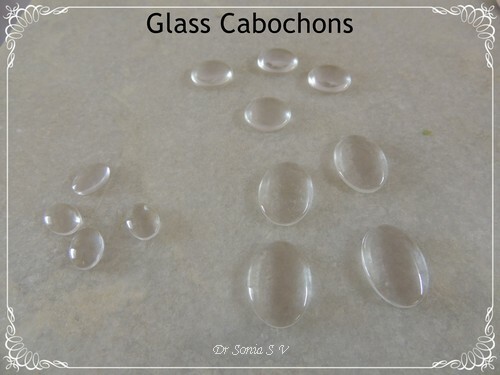 I laid my hands on the gorgeous glass domes called cabochons only recently and have fallen in love with them! 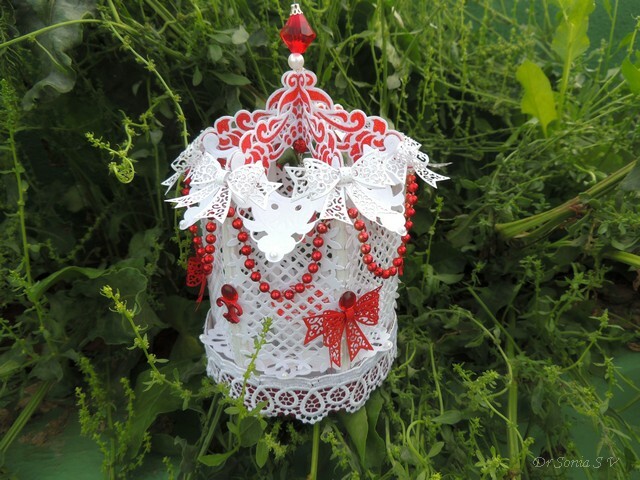 They are economic, super cute and super easy to transform into embellishments and jewelry! 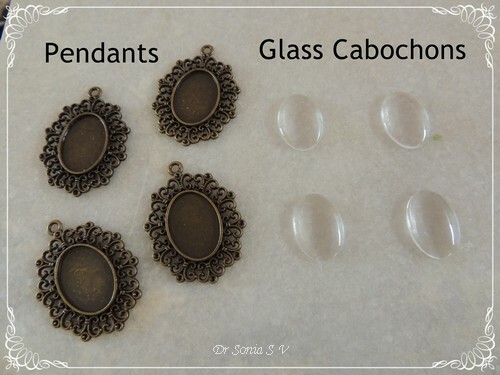 I wasn't really sure how to use them and when I Googled, I landed up on several you-tube videos.I am more of a pictorial person than a video lover so thought I would share the simple steps to make the glass cabochons if you are like me, and love to run through a pictorial in seconds than spend so much more time watching a You-tube video! 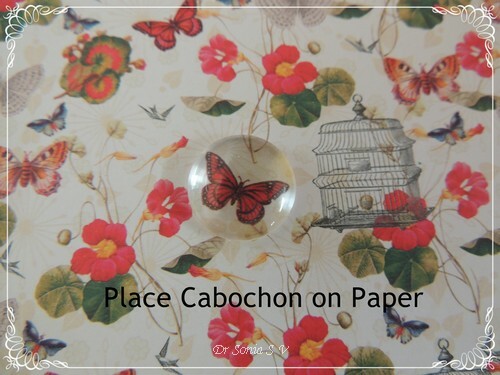 Choose a pretty pattern paper /glitter paper/ fabric or even a special photo to use with your cabochon. 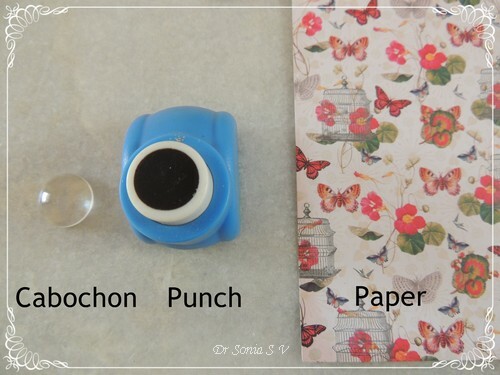 If you have a punch the size of your cabochon...makes your life even easier-- but it doesnt really matter! 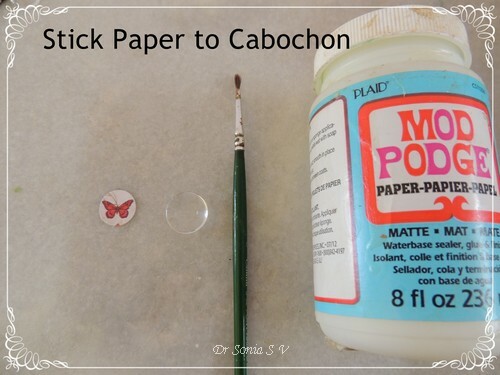 Place your cabochon on the design you want and trace loosely around with your pencil and cut-- you don't have to be super accurate as the convex edges of your cabochon will hide all little jagged edges and minor mistakes!! 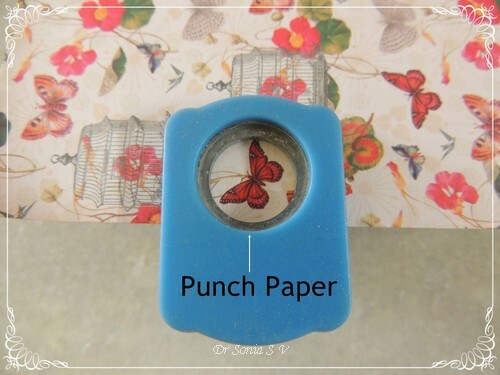 If you have a punch that fits your Cabochon size like I did- punch from the under-surface as shown above so that you can see exactly where you are punching. 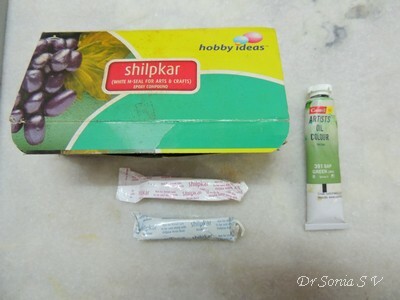 Apply a clear drying glue like Modpodge [can also use our good old fevicol mr ]on the flat under-surface of your glass cabochon with a paintbrush/ foam etc. 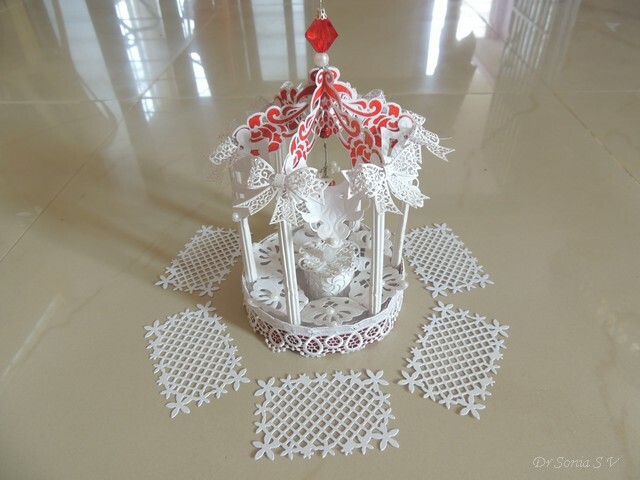 Place your paper cut on it and blot with a tissue/ cloth and leave to dry. Dont you love the lovely transformation of that bit of paper! The sparkling gem studded dome atop is a broken earring I recycled and the diamond chain was snipped off and old dress! 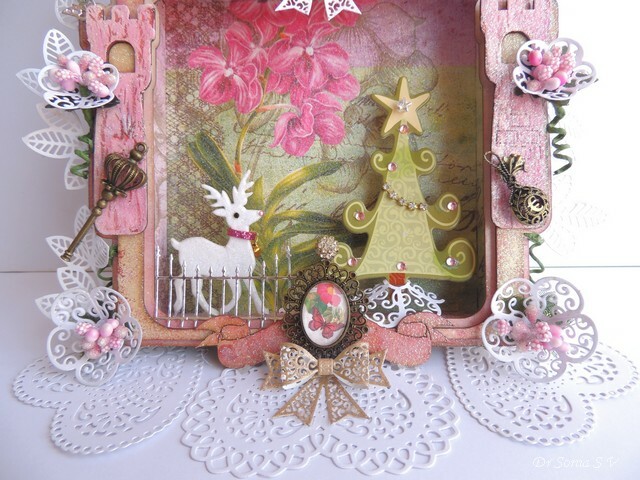 My Castle Shadow box holds a royal Christmas scene with a glittery foam reindeer and a chipboard Christmas tree decked in rhinestones and a diamond chain [snipped off the old dress!] 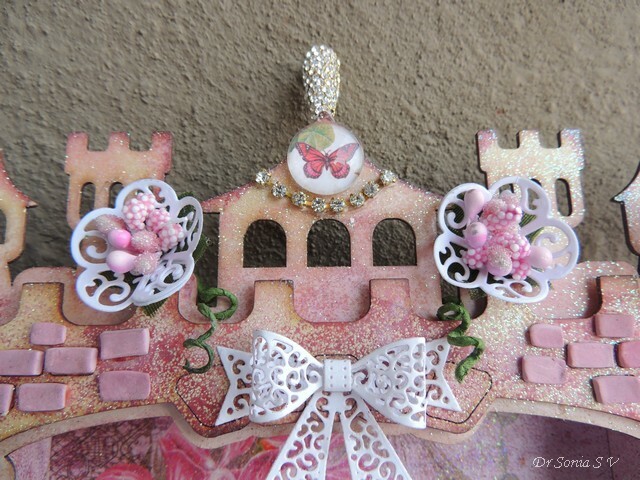 Added a metal filigree Glass Cabochon pendant on the Castle Banner to step up the grandeur! 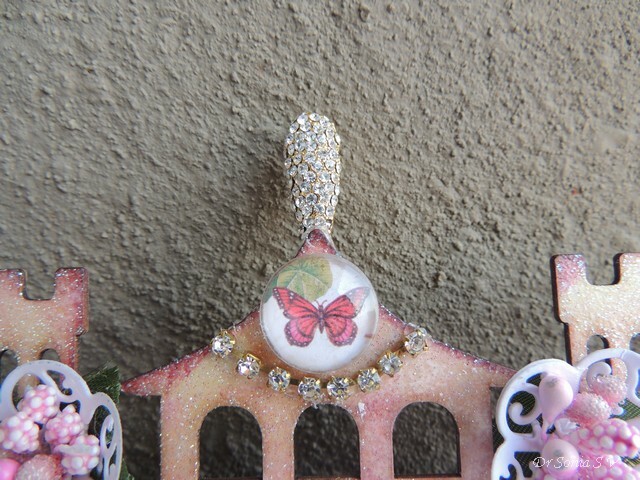 Most of the glass cabochons have matching metal case pendants to make jewelry like earrings and pendant but paper crafting being my first love I used my handmade pendant on my shadowbox! The gemstone stop my pendant is recycled from an old earring! 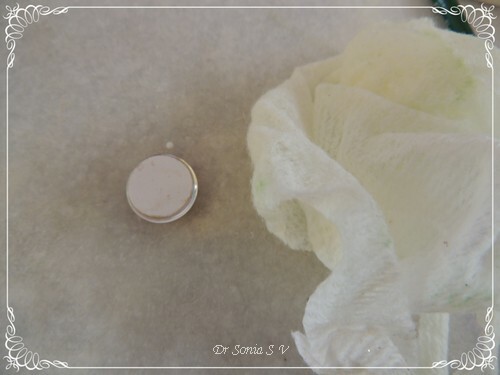 Lots of ideas to use the Glass Cabochons --you can adhere a bit of felt to the back and use it on dresses or adhere it to a magnet and use it as a cute fridge magnet! 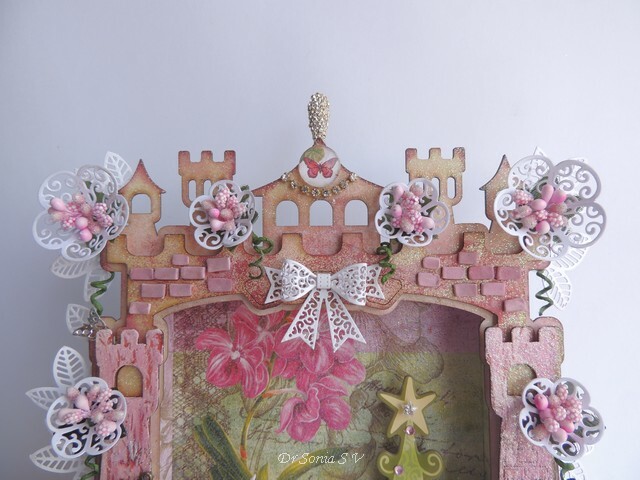 More about my Castle...here you can see the shimmer of the castle and the little bricks I made using clay which I rolled out,cut up and inked with distress ink! 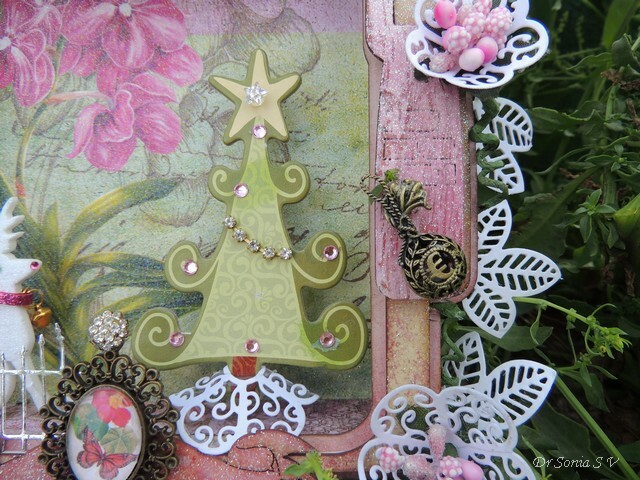 Used the tattered lace rose die to make 3 dimensional flowers with crystal beaded pollen centers and the also used the same die to make a stand for the Christmas tree . 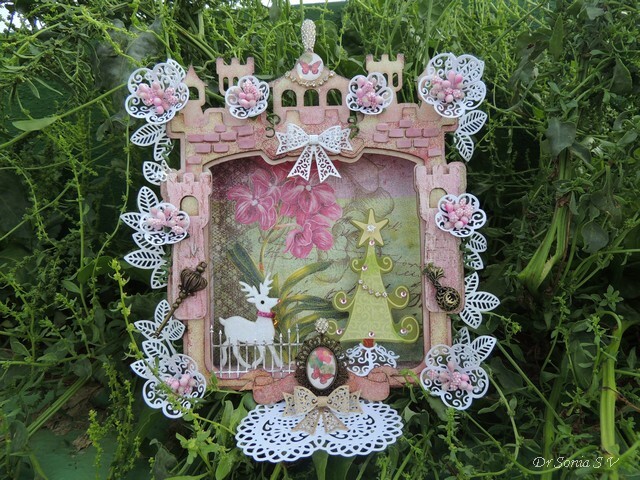 My little girl felt the reindeer and Christmas tree did not match the castle ...but somehow Christmas is on my mind and I couldnt bring myself to remove them!! Added a royal scepter charm atop a "crackled" castle turret! For my non Indian friends lemme explain the heading "Diwali Lantern" ...being a multicultural country we have many many festivals in India and Diwali is a widely celebrated Hindu festival and its also called the festival of lights ---it celebrates the victory of "light over darkness" or "good or evil"! 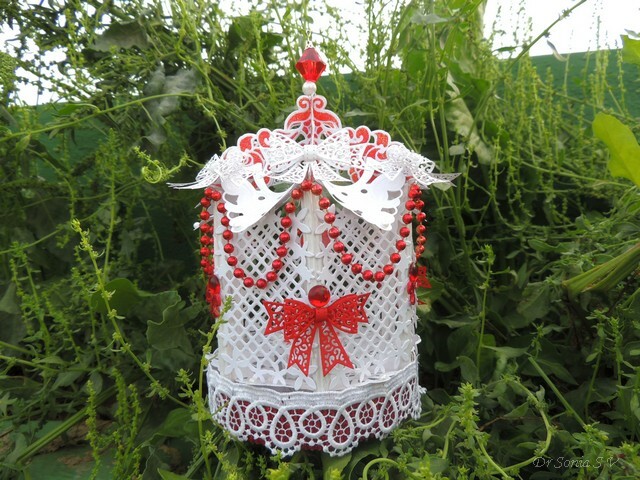 We light oil lamps, lanterns and have a blast with firecrackers! 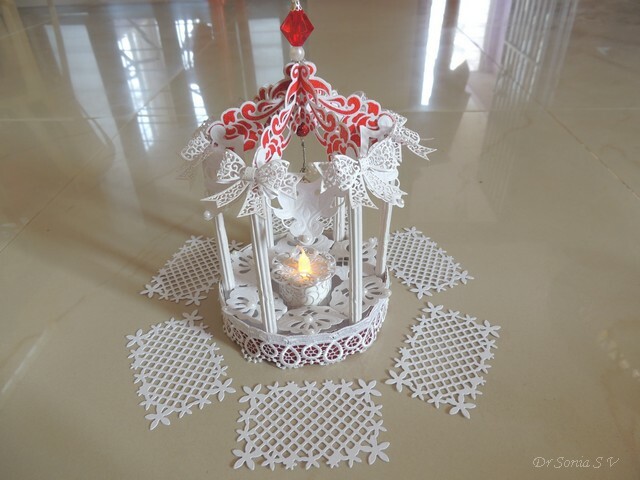 This year I thought I would make a Paper Diwali Lantern . 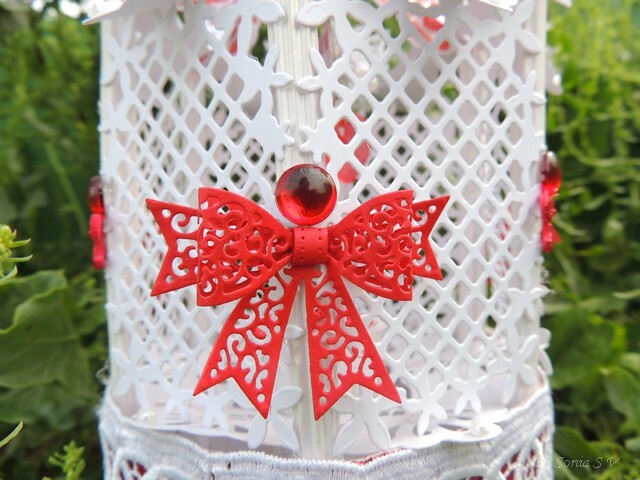 I love lattices and decided to dress up my basic lantern by adding lattice die cuts between the pillars of the Paper lantern. 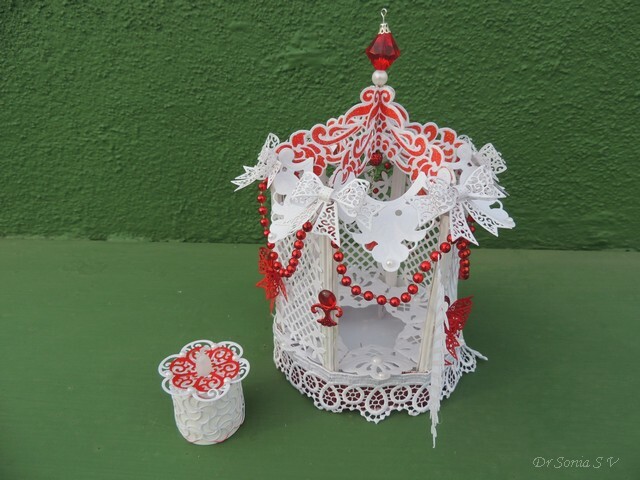 The Paper Lantern houses a battery operated tea light and like every crafter who has laid hands on one of these...I just love how the light shimmers! 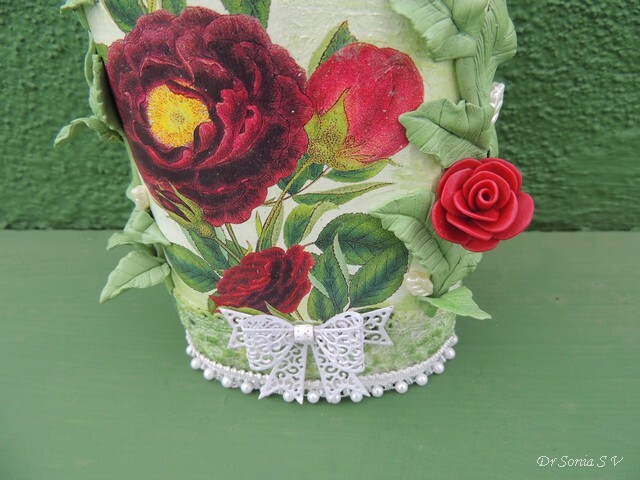 At first kept it simple with just lacy red bows and rhinestones. 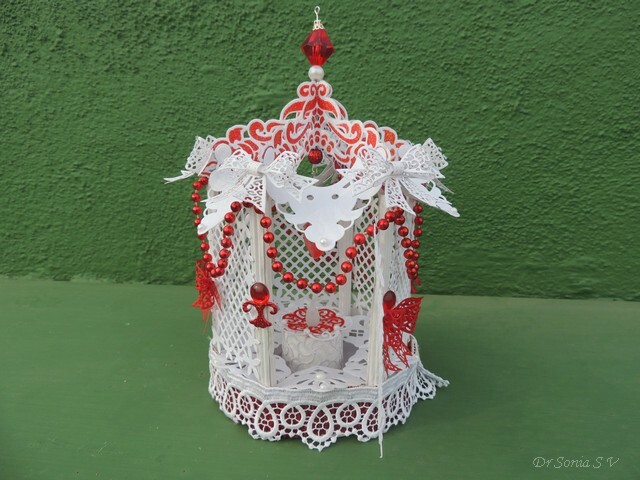 Red and white is a favorite color combination of mine and I think I can use this lantern for Christmas too [ Yes we celebrate Christmas too at my home !!] 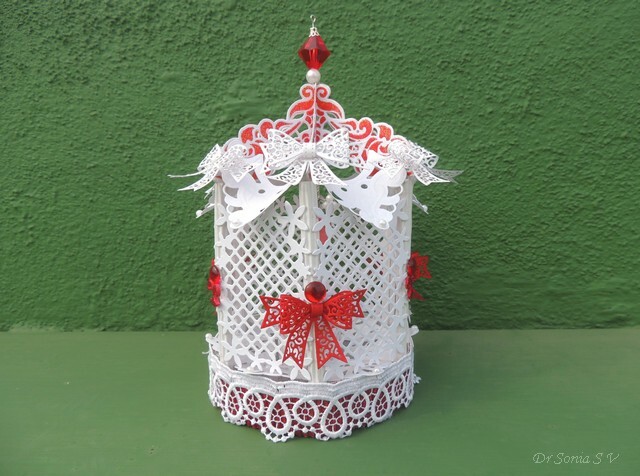 The photo below shows the bows alternating with the glittery embossed Marianne die cuts in the roof of the paper Lantern. I hinged one of the lattice windows instead of sticking it so that it can swing open . You can take out the tea light and switch it on when you want to light up the festive Lantern! My daughter and I debated whether to add the red beaded garland or not...simplicity versus grandeur...and well since it was a festival project...the more decked up the better...right? I hope you agree!! 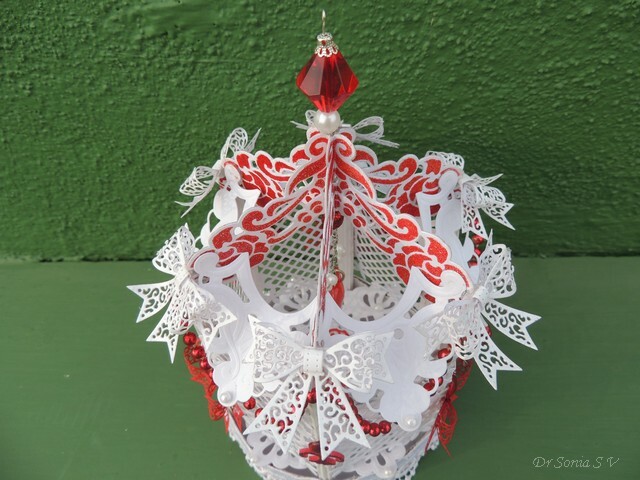 Do tell me how you liked this festive lantern! 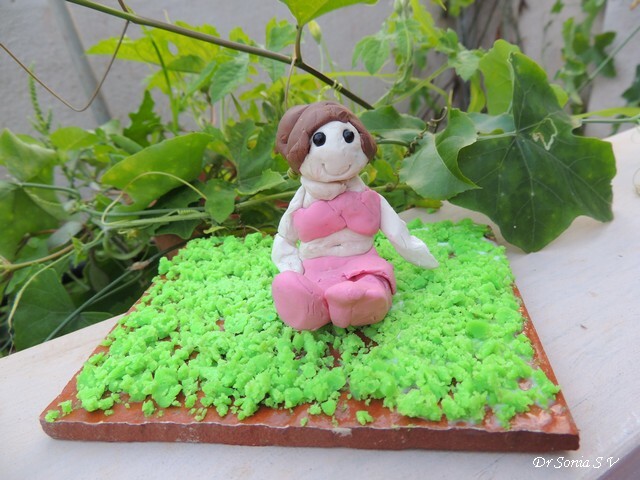 Dear friends super excited to share some clay models made my by little daughter[ she is not so little any more-- she is 8 now! 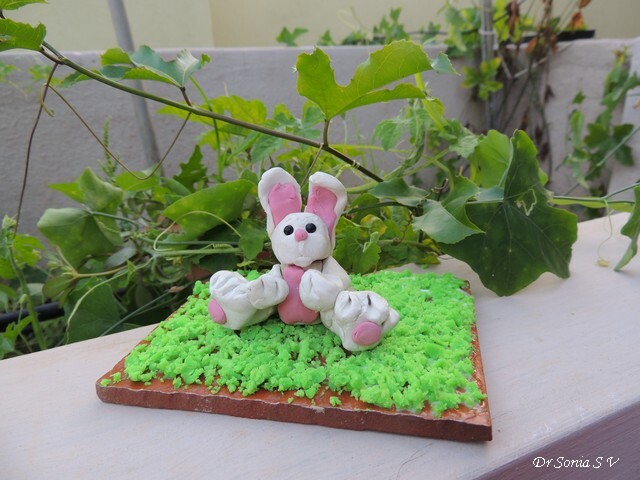 ].Like many doting mums I do buy expensive toys for my little girl but despite me and her grandmother spoiling my little girl with expensive Barbie dolls, I am proud to say my daughter has the most fun while crafting with her hands!! My daughter has holidays now and today my husband acted as babysitter! 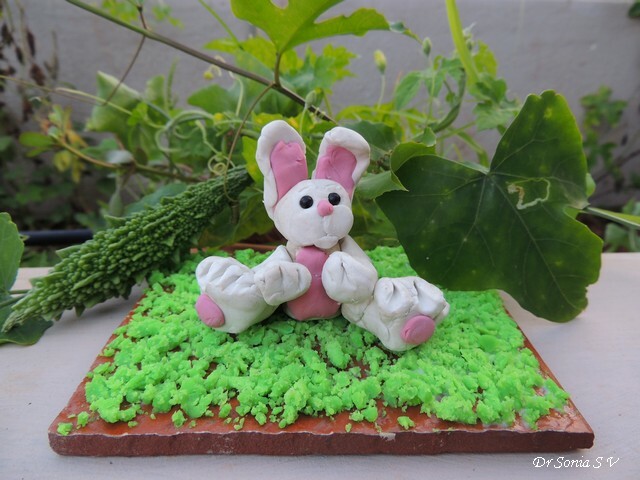 I was so thrilled to be greeted by this cute clay bunny on clay grass when I cam home from my Clinic today! 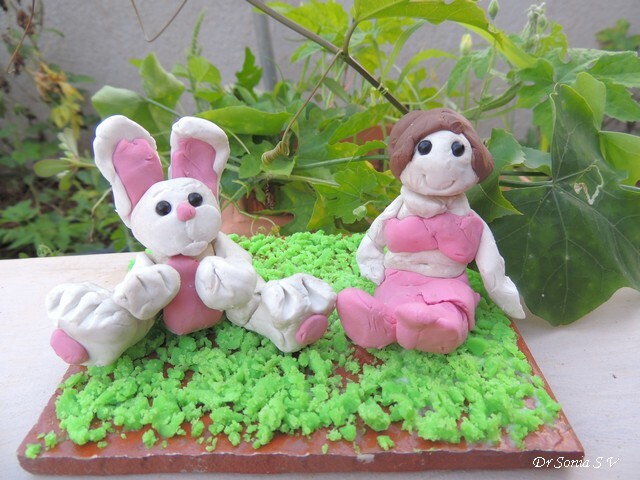 Her father gave her an old tile to put her clay models on and she was so excited we loved her clay bunny she made a Clay doll to keep her bunny company! 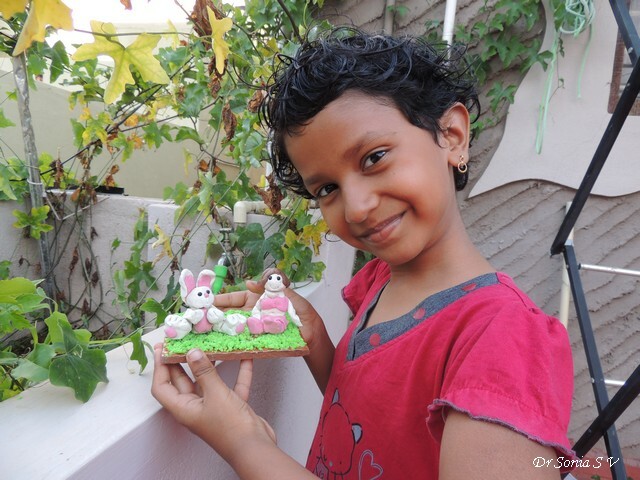 And here is my darling Clay artist with her clay models! Do pen down a few sweet words for my kiddo....believe me she is going to want to read all the comments and ask me what each one of you had said! !